TWF's Gala Dinner is happening tonight! This Wednesday, October 24, we will hold our annual Gala Dinner at JW Marriott Hong Kong. Under the theme of "Rising Voices", it will be a night to recognise and celebrate courageous voices coming together in the pursuit of gender equality. By speaking up, men and women are making history, right here, right now. At the much-anticipated event, we are thrilled to be featuring Laura Zelenko, Bloomberg News' Senior Executive Editor for Diversity, Talent, Standards and Training and leader of the global "New Voices" campaign at Bloomberg News; video remarks by Arianna Huffington, Founder of the HuffPost and Founder & CEO of Thrive Global; and our TWF Male Allies Hong Kong in conversation about their groundbreaking efforts to drive gender equality in Hong Kong. With the calibre of speakers and programmes, we are also excited to reveal our Silent Auction and Luxury Draw prizes very soon, watch this space for more details! 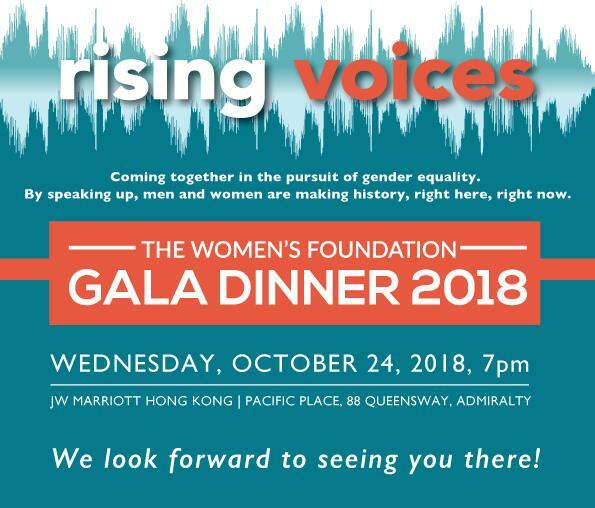 Use the hashtags #twfhkgala2018 and #risingvoices to unite yourself with others engaging in the conversation for our inspiring Gala Dinner this year!